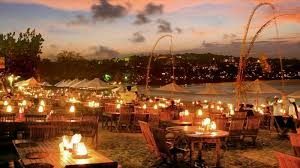 Jimbaran is a village consisting of 12 banjar adat and 1 banjar service in the area of South Kuta District, Badung regency, Bali province, Indonesia. The location of this region is adjacent to Sanur and Nusa Dua and Ngurah Rai International Airport. 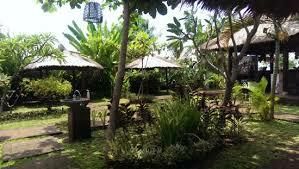 The traditional village of Jimbaran was originally a fishing village as well as a farmer. 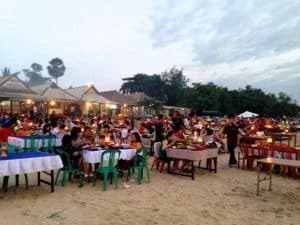 Since in the Jimbaran beach area, there have been many seafood restaurants in South Bali as well as some international hotels, now the livelihood of local people is more towards tourism. 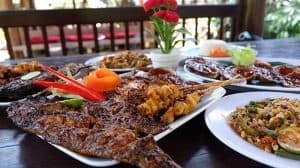 You can find the best food in Jimbaran. Here is the list of the foods. It is located at Pantai Muaya Jl. 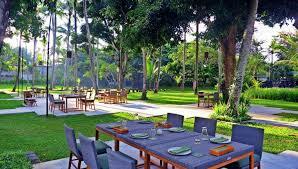 Four Seasons Resort, Jimbaran Bali, Menega Cafe provides dining options within the restaurant as well as on the beach. A row of aquariums containing fresh sea fish, crabs, and lobsters are here. Some of seafood can be processed by way of grilled to fried flour. Menega Cafe is the most crowded around Muaya Beach. You can taste the good sea food that is very delicious here. Still bluffed at Muaya Beach, a place to eat that has existed since 1991 this could be the choice of eating seafood while enjoying the beauty of the beach. Variety of seafood is available here. You can enjoy the shrimp, fish, squid, crab to lobster. 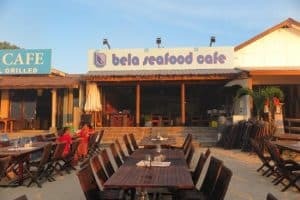 Bela Seafood also has several set menus that can be selected visitors. All of these menus are so delicious. Imagine that you have a great dinner with your lovely persons here. For those who packed the package menu includes soup, salad to young coconut. It is located at Jimbaran Beach, Jl. Great Pioneer, Jimbaran, Bali. You can visit it at night. This simple shop in Jimbaran area has a special seafood dish and the price is affordable. The menu is available only fish (white and white snapper), white shrimp and shellfish. The use of spices genep (complete Balinese flavor) before the burning to make seafood taste more delicious. Moreover it is mixed with sambal matah and fried garlic. It is located on Jl. Uluwatu 2 Jimbaran, Bali. Although not on the beach, restaurant Cuca could be a destination Spanish food lovers who go to Jimbaran. Tapas become the main dish of this wide-open restaurant. Although carrying the western menu, Cuca claims to use 100% local materials. Here you can try Cuban Corn, Crispy Fried Chicken, Claypot Mushroom Rice or BBQ Octopus. It is located in Cuca, Jl. Yoga Perkanthi, Jimbaran, Bali. 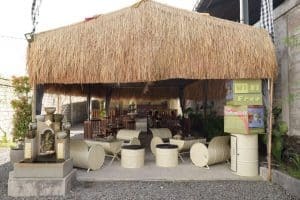 Rock Bar is one of Bali’s favorite bar destinations. 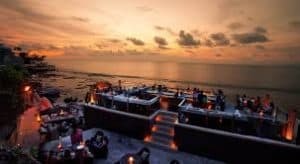 This bar stands on a natural stone 14 meters above sea level with beautiful sunset views. The more complete accompanied by the waves of the Indian Ocean right in front of him. Rock Bar has a treat Rock Bar Seafood Dinner where visitors can enjoy a variety of refined fresh fish fish chef selection. There is also a selection of artisan cocktails as well as tropical fruit juices. It is located at Ayana Resort, Jalan Karang Mas Sejahtera. 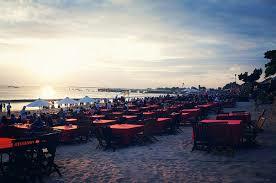 Although the name is Jimbaran, the location is in Denpasar. Many say that burned mussels here most delicious. Roasted combustion in this restaurant sweet marinade and baked until soft until black. The restaurant opens from 9 AM to 11 PM. It is located on Jl. Kawe Island No.57B, Pedungan, South Denpasar. 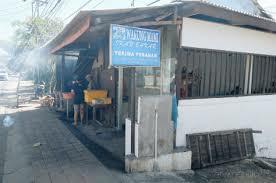 Warung Tulen sells the only 4 menus, they are Fish, Shrimp, Calamari, Shellfish – everything is burned. If you want vegetables, there is Kangkung Plecing ready to serve. Roasted mussels here are also famous tasty and cheap. It’s only 20,000 per share. In addition, you can also enjoy other sea fish. Here, you can enjoy the sea food with the savory taste. The sea food is cooked really well. For those sea food lovers, you need to try them. Warung Gurih-Gurih is actually not a stall anyway, it is more like a restaurant. Many people said that the most delicious menu in this place is is the mussels. The type of flavored shellfish here is sweet and caramelized. For other menu there are small grilled fish (3-4 ounces Rp 46ribu), 10 pcs baked shells Rp 35ribu. There were also shrimp, squid, chicken, duck. Thevariation of the menu is so various. You can experience eating sea food with a really good taste. There are also packets of shrimp, chicken packets, fish packages, etc. Not really cheap compared to other eating places above. But this could be one alternative to eat seafood that is still affordable to me. This restaurant is one of the most crowded in Jimbaran. The prices here are reasonable and of course the fish is fresh. In this restaurant, they have many Balinese female singers who come to each table singing good local songs. The food is delicious and the atmosphere is amazing. 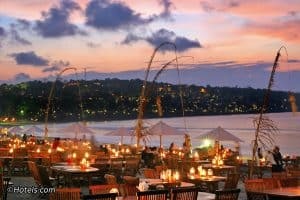 Besides the delicious food, this restaurant is also unique.You can enjoy a thousand lamps with the view of night beach when having dinner. This is a special dining place. This is also called 3-in-1 eating places: seafood makes melt mouths and a pleasant atmosphere, and reasonable prices. The quality of the seafood is top notch. You will taste the savory sea food ever. Besides, the seasoning of the sea foods also mixed really well. There is also a group of men with black suits that bring music directly to your table! An amazing experience! You can enjoy your meals with the beautiful music. 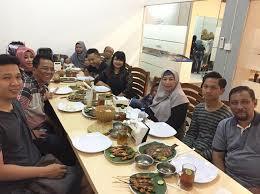 Those are the best place to look for the foods in Jimbaran. 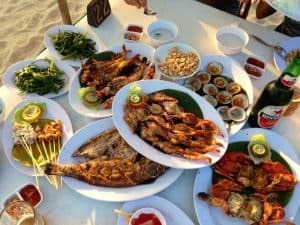 Jimbaran is the heaven of Balinese dish and sea food. It is also a romantic place for dinner.